So, you've tried all of the lead generation best practices for your website. You've experimented with your copy, your colors, forms, CTAs, and more—but you're still not hitting your goals. Like so many marketers and agencies, we've been there -- and so has Peep Laja, CXL Founder & Principal. Your website design is the key to boosting online conversions and has the power to influence visitors to drive them down the funnel. But far too often, the UX is overlooked for pretty designs and excessive bells and whistles. Your site should still look great, but first and foremost, it should be focused on conversion. Drawing from the latest research on neuro-web design and the results of numerous tests, Peep has unlocked the secret to designing your website to be a lead-generating machine. In this 60-minute webinar, Peep shows you a framework for persuasive web design that you can use for influencing user behavior on your website and getting visitors to take the actions you really want them to. Whether you're a marketing agency or a small B2C or B2B business, you walk away with actionable, progressive insights into how to optimize your conversion rate and improve your overall website user experience! 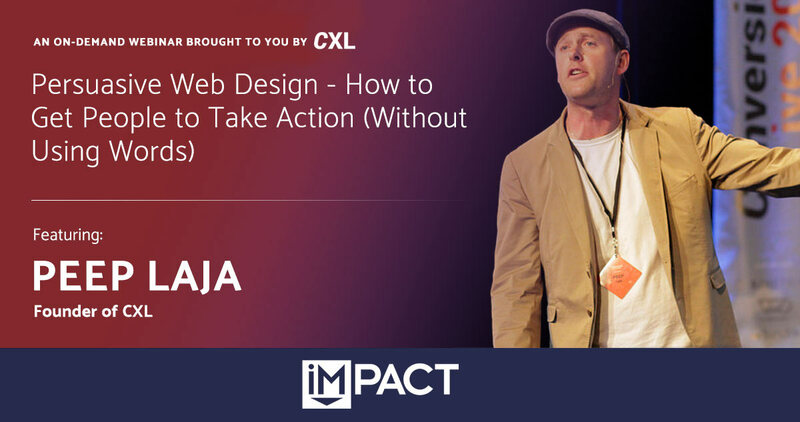 Peep Laja is the founder of CXL and CXL Institute, which train marketers in all things data-driven and runs one of the world's most popular data-driven marketing blogs. He is a big believer in evidence-based marketing. Everything he does comes from analysis, data, studies, and insights from customer research. His specialty is conversion optimization - helping companies get more revenue from their website. He has a knack for looking at vast amounts of various data, putting the picture together, and translating that into necessary steps to improve conversion rate.